As many of you will know, I have a slight obsession with waders. 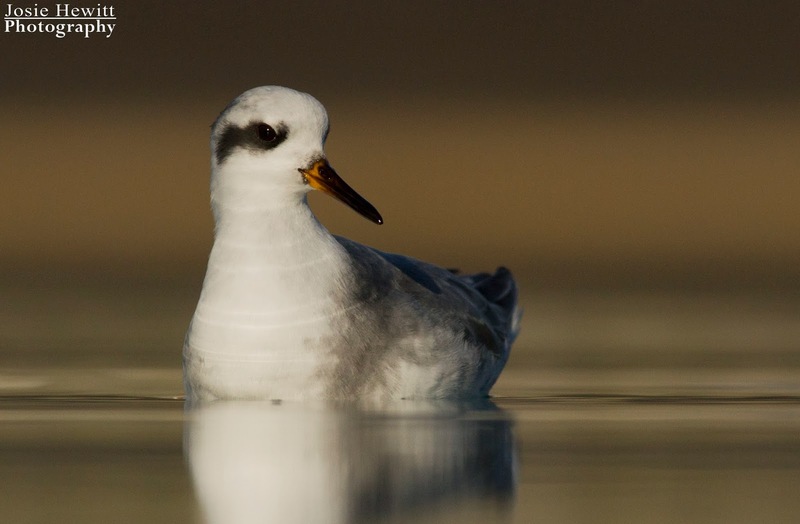 This intense fascination only furthered my amazement when I found out that there are only 3 species of Phalarope found in the entire world! 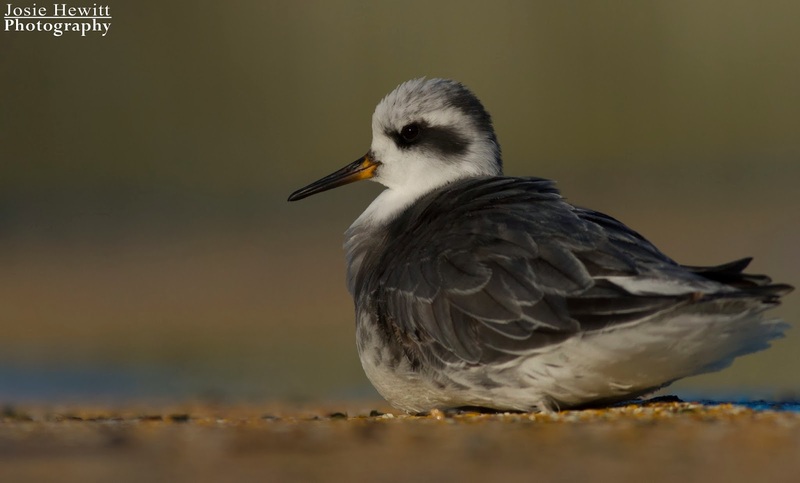 Now this seems weird to me, I mean there are loads of species of snipes, shanks, plovers and calidrids...but why so few Phalaropes?! Well, unfortunately I do not know the answer, but if you do, or have any guesses as to why this is the case, please do get in touch as I would be very interested to hear your views! 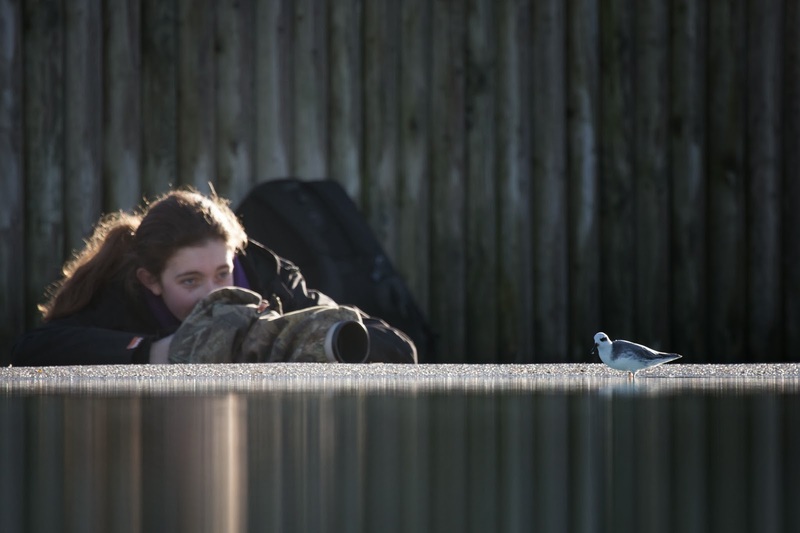 As the school week continued in its usual boring and homework abounding way, I decided that if the weather held out for the weekend then a day out birding would be necessary! 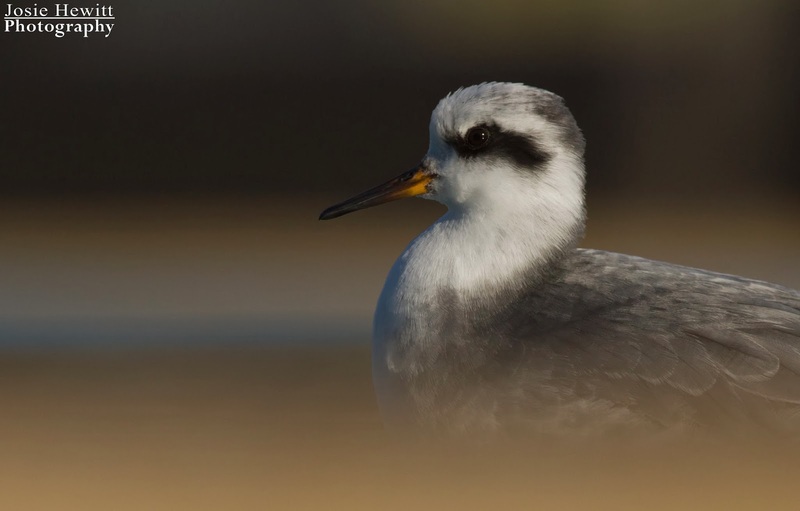 On Friday evening my friend Alex and I decided that the weather forecast was looking perfect for Saturday and, as Grey Phalarope was a species that neither of us has seen before, we decided that it was the perfect bird to target. Train tickets booked, camera batteries charged and memory cards cleared, I was all set for Saturday's adventure! Up bright and early we caught the train to Clapham Junction where we changed trains and met another young photographer, Danielle. We then got on our next train, Portslade bound. Arriving at Portslade (near Hove) some 60 minutes later, we immediately started quick-marching it down the high street, heading for the children's paddling pool that the bird was purportedly occupying. 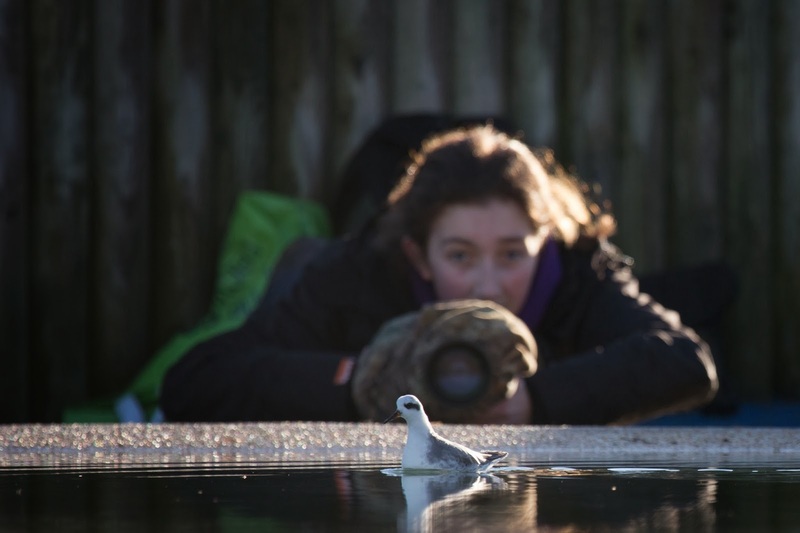 We got there in 15 minutes and were greeted with the sight of a row of photographers lying down on the pool's edge being treated to stunning views of this amazing arctic wader feeding just inches in front of their lenses. Anxious to start snapping, we got our cameras out, lay down at the edge of the pool and within a matter of seconds were being treated to some of the best views of a bird I have ever had!! 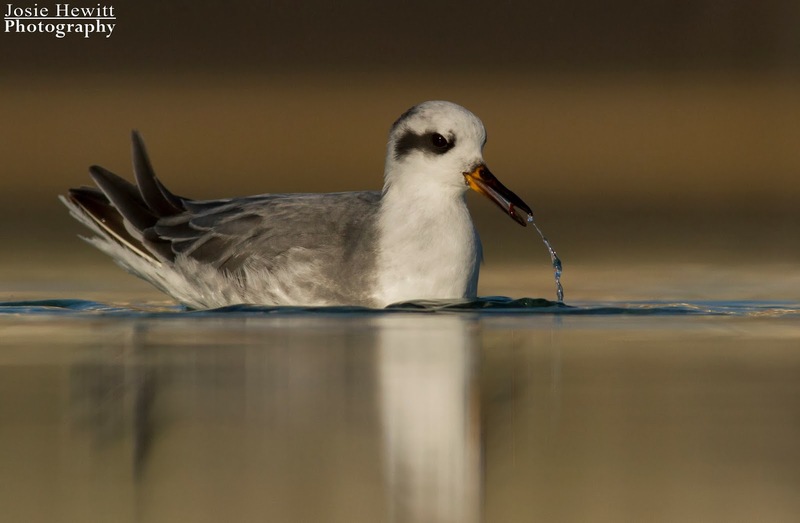 The Grey Phalarope (also called the Red Phalarope - Phalaropus fulicarius) is a small wader that breeds in the Arctic regions of North America and Eurasia. 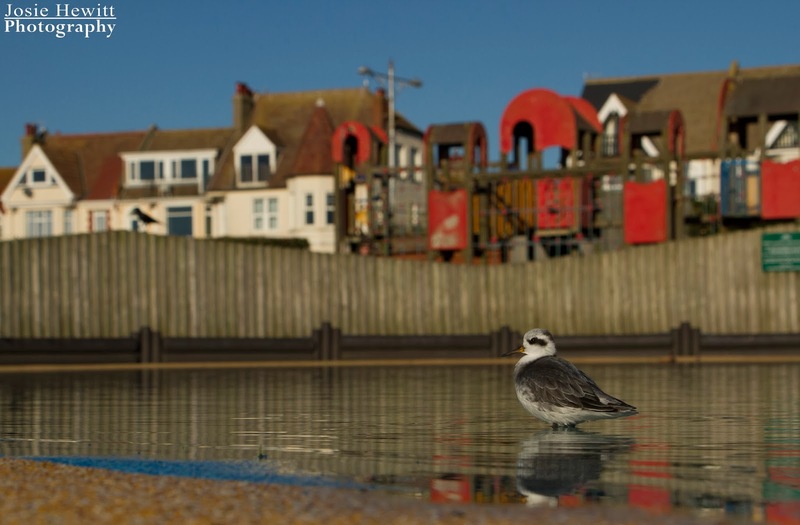 It is migratory but usually spends its winters at sea on tropical oceans, not in a children's paddling pool on the south coast of the UK!! 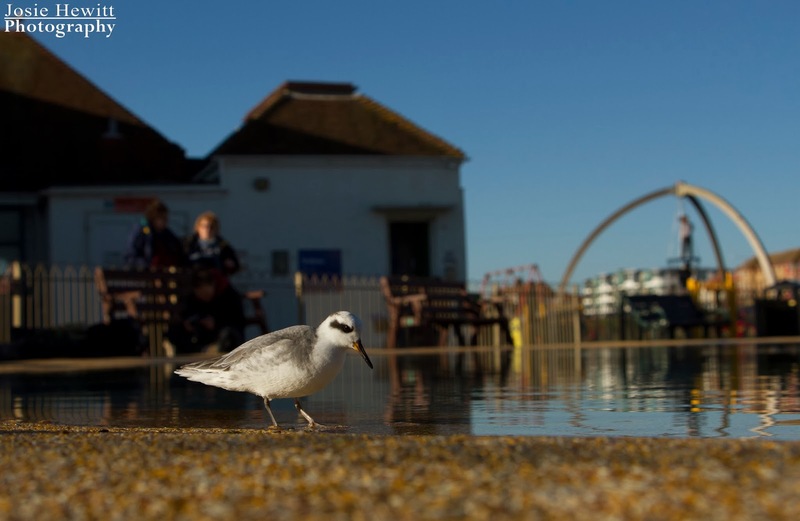 Around 200 of these delightful birds grace the UK's shores each winter, but even so, it is very unusual for them to show quite so amazingly well! 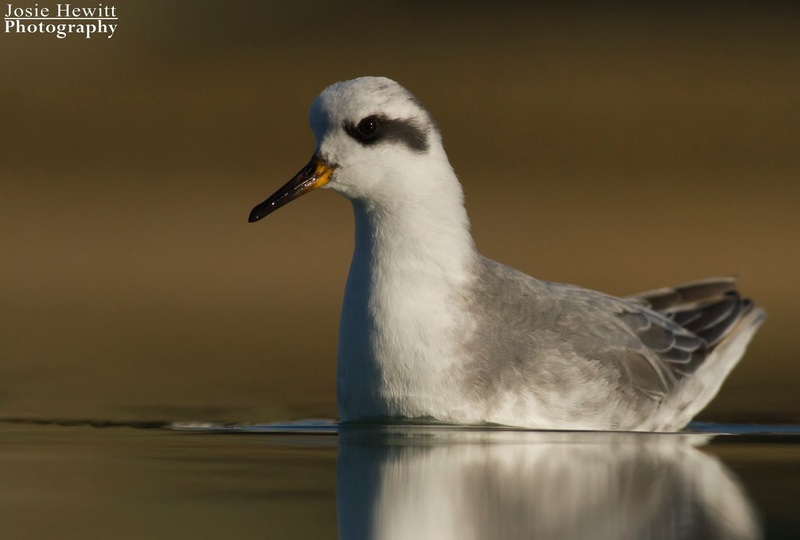 As with a lot of birds, all three species of Phalarope (Grey, Red-necked and Wilson's) are sexually dimorphic. 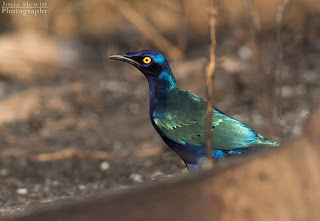 Usually this means that the male's plumage is brighter and generally more stunning than the females. 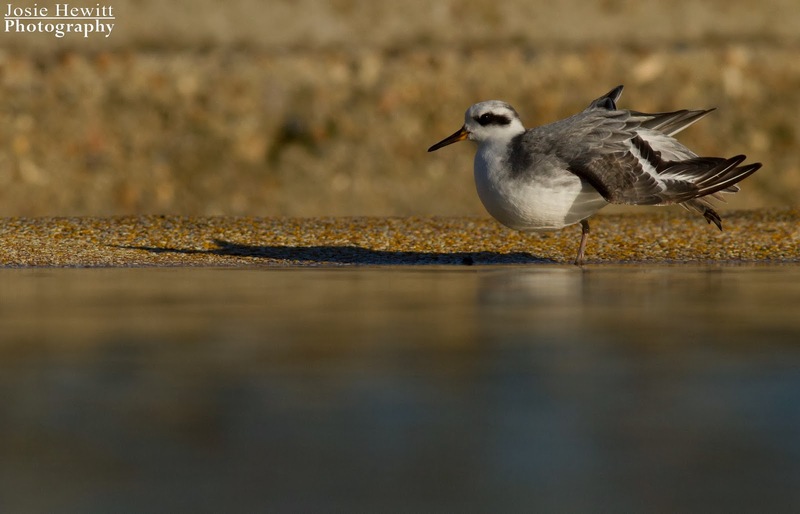 However, in all of the Phalarope species this sexual dimorphism is reversed so that it is in fact the females that are larger and more brightly coloured, rather than the males! We stayed with the bird until about 14.00 and I have to say, I was sad to leave! The bird had showed ludicrously well and I had filled most of my memory cards; an event that I'm sure won't be repeated for quite some time! 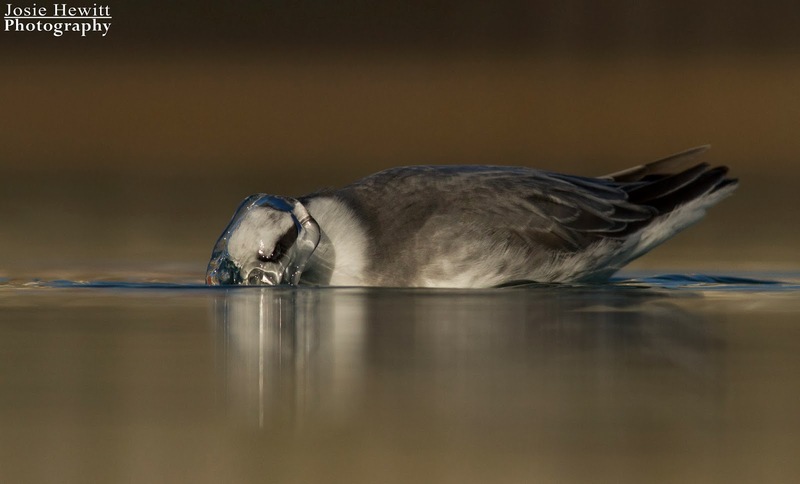 A simple image of the Grey Phalarope in the water. 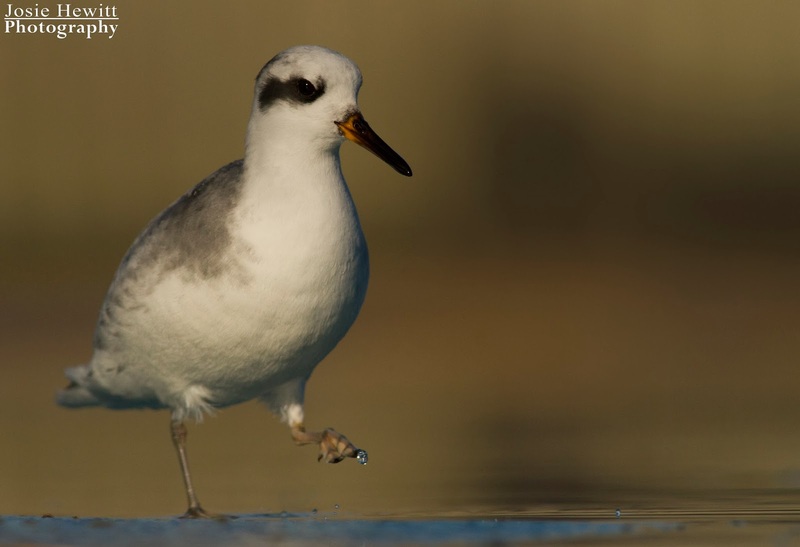 feet that are similar to those of a Semi-palmated Sandpiper! A simple shot of the bird doing what it does best - swimming. down on the edge, even falling asleep on a few occasions. shows the water - its motion frozen in an image. I was ready to capture it on camera! environment - a children's paddling pool in front of a climbing frame! A nice wing stretch shows the lovely primaries and secondaries that are otherwise hidden! 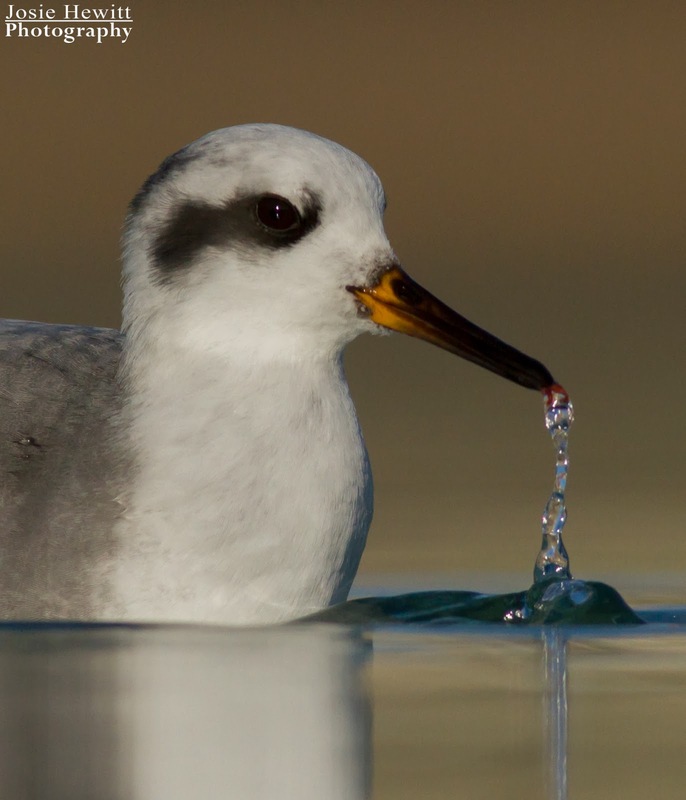 Excellent photos of a special bird. As for why there only three - I've no idea, but you might also ask why there are only two turnstones! Neat shots, Josie- especially those wide-angles! Great shots and well written Josie. Awesome stuff Josie! Keep it up. Waders, waders and more waders!